Amaretto is nowhere near sour, on the contrary it is very sweet. Not even the official drink Amaretto Sour is sour enough for me. 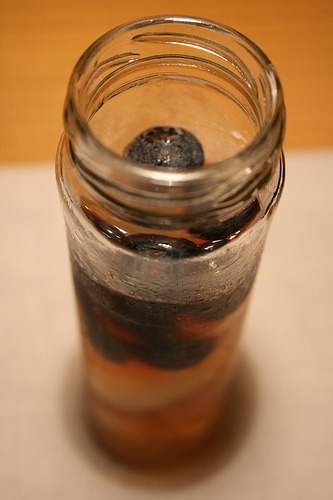 I was out to dinner with my husband last weekend and he ordered an Amaretto Sour, and within the glass walls of this drink were Amaretto soaked blueberries---which gave one pause. Well, at least it gave me pause. It was good: and I knew I wanted to play with the flavors. So I buzzed into the liquor store today, with it in mind to pick up some 'sour' to go with the Amaretto. I read the label, turned on my heal and promptly walked out empty handed. For the most part, Sour is also called 'Sweet and Sour' and is basically simple syrup (sugar and water) with some [far from fresh] citrus for effect. Besides, I am liking the premix parts of my drinks less and less. Now, I could make simple syrup easy enough, but I thought the drink would stay too sweet, so instead I focused on the citrus side and went for Agave Nectar---in splash form---to finalize this drink. (You can buy agave nectar in the sugar/baking aisle of many grocery stores). Don't walk away just yet: if agave is completely foreign to you, it isn't required to make this drink worthwhile. In the end, all you really need is a lemon. Fill tumbler/neat glass with ice (this is your smaller glass, the one half the size of a pint glass). For my glass, I used a chilled jar. Fill 2/3 full of amaretto. Add juice of one lemon. Add optional blueberries and agave.